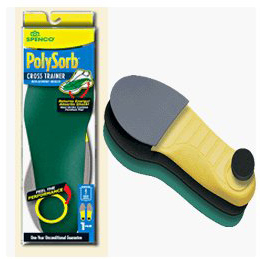 The SPENCO® POLYSORB® Cross Trainer Insole has been a crucial running aid for me. It has allowed me to train hard, with interval training, and stay completely away from shock-related running injuries. * Cushioned heel strike zone. * Easily modified with scissors. * Good for court sports. * They provide a contoured heel cup and arch for even more comfort. I am 6'2" - 185 lbs and these have held up fine for me. They come with a 1-year warranty, but mine have easily lasted two years. I run about 25-30 miles per week, but a lot of it is interval work. I assume the Spenco Orthotic inserts would be fine for guys who are heavier or put in more training miles. I've been very happy with the comfort and the injury-prevention features of these running shoe inserts. I've tried others, many years ago, but it was like running bone-on-bone. Actually, I got the Spenco Orthotic inserts because I liked my Spenco gel biking gloves so much. It turned out that their running shoe inserts were the same high quality.